Amrita Institute of Medical Sciences has been granted NABH (National Accreditation Board of Hospitals & Health Care Providers) accreditation. Amrita is the first university teaching hospital to get NABH accreditation in the country. National Accreditation Board for Hospitals & Healthcare Providers (NABH) is a constituent board of Quality Council of India, (http://www.qcin.org/) set up to establish and operate accreditation programme for healthcare organizations and to set benchmarks for progress of health industry. Amrita has become a Nodal Centre for clinical research in the southern region with the inauguration of the Amrita-Pfizer Preferred Research Centre Secretariat here on Saturday 27th of June. The Secretariat will be where all the central coordination of research activities (including administrative, financial, legal as well as supportive research components such as protocol development) takes place. This is a key achievement which will enable both Amrita and Pfizer to enhance clinical research activities in South India. Dr. Sanish Davis, Clinical Research Manager, Pfizer, stated that Pfizer was very happy to have such collaboration with Amrita Institute of Medical Sciences because Amrita is one of the very few healthcare institutions in India that give equal importance to both healthcare and research and that Pfizer is committed to improving the quality of clinical research in India. 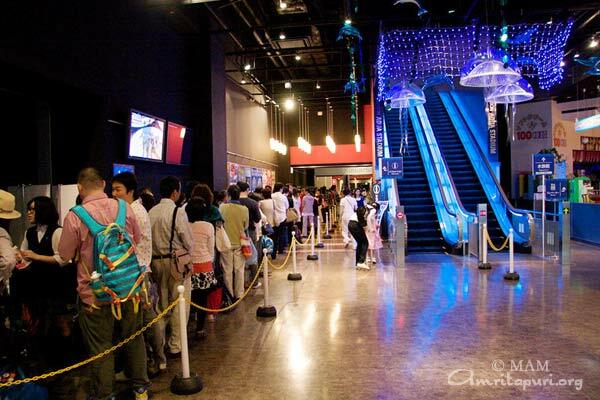 The fourth stop on Amma’s 2009 Summer US Tour was Albuquerque, New Mexico. 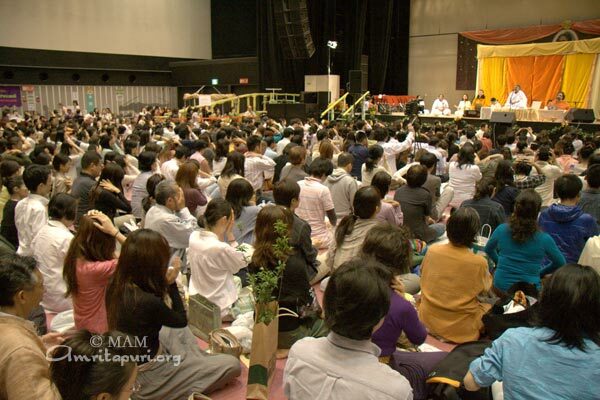 Amma held programs in the city for five days, including a three-day retreat. 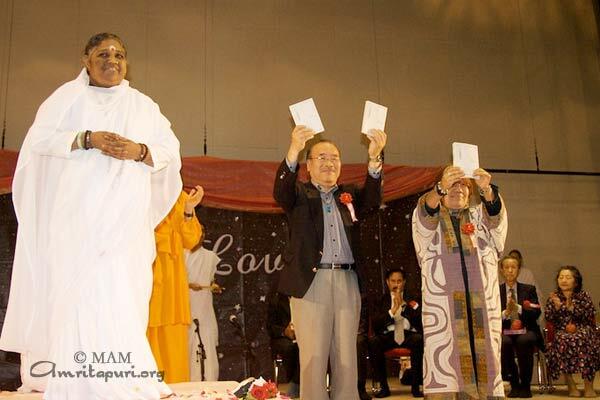 On the second night, Amma was welcomed by Senator Linda Lopez, a member of the Senate of New Mexico, as well as two prominent area doctors: Dr. Cheryl Willman, the director and chief executive officer of the University of New Mexico Cancer Research & Treatment Center, and Dr. Vasant Lad, founder of the Ayurvedic Institute of Albuquerque. A surprise guest on the first night of the retreat was renowned sarod maestro, Padma Vibhushan Amjad Ali Khan, who teaches at the University of New Mexico. Amjad Ali Khan came seeking Amma’s darshan and blessings, presenting her with his latest CD, Ancient Sounds. Amjad played several traditional ragas and original compositions. 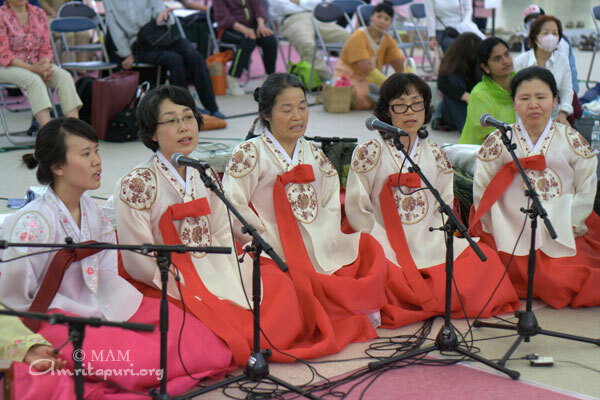 That same day in the evening, there were more traditional music performances, including West Africa, Native American and a whirling dervish. 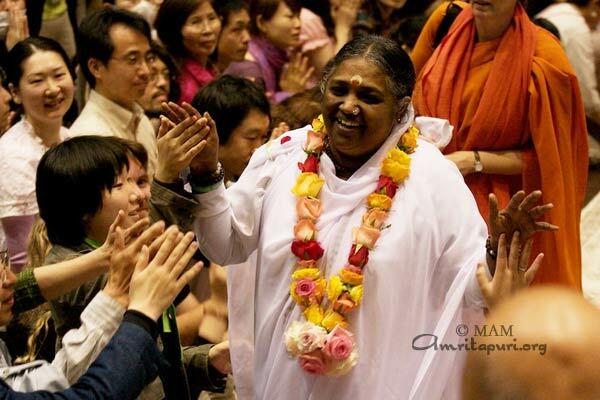 The most heart-capturing “performance” of them all came from Amma herself—who on two occasions concluded darshan with ecstatic bhajans—”Khol Darvaza,” “Dao Dao Dao” and “Meri Jhopadi”—which had the New Mexico devotees dancing and singing with all their hearts despite the late hour. 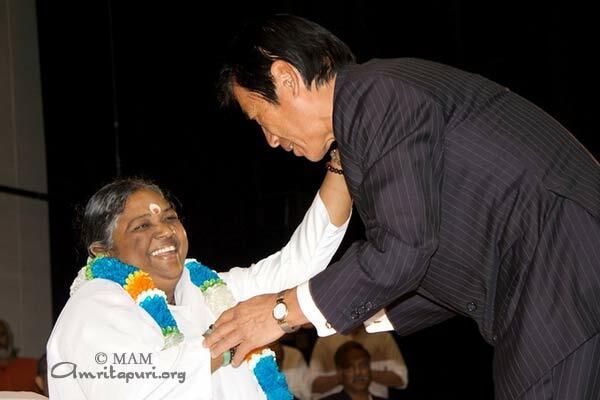 When Amma came to Los Angeles for her annual visit, she was welcomed by a number of California politicians, including the Mayor of Santa Monica, Michael Feinstein and Los Angeles City Councilwoman Jan Perry. Senator Gilbert Cedillo’s Office also sent an official certificate of commendation and recognition. Before garlanding Amma, Mayor Feinstein spoke about Amma’s humanitarian projects, specifically praising her programs assisting impoverished agricultural families. Perry continued: “It is honour to just recite the many gifts you have already bestowed around the world—in Kenya, to the Bush-Clinton Katrina Fund, to tsunami victims, to prevent suicides of farmers who are having agricultural problems and the many educational and medical programs throughout the globe. 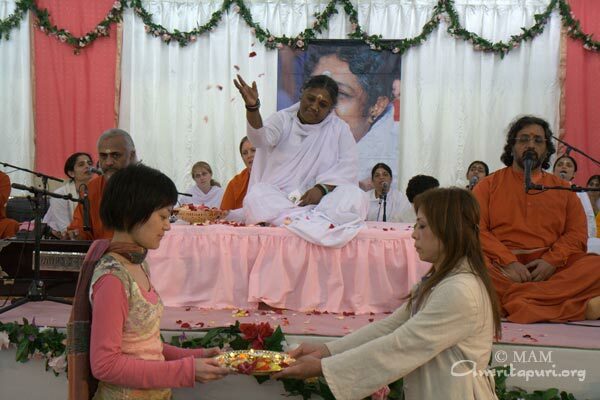 The second stop on Amma’s 2009 U.S. Yatra is San Ramon, California, home to Amma’s ashram headquarters in the United States, MA Center. June 6, World Environment Day, found Amma’s American youth organization, AYUDH – America, brought various fruit-tree saplings for Amma to bless. They then planted the trees on the premises. 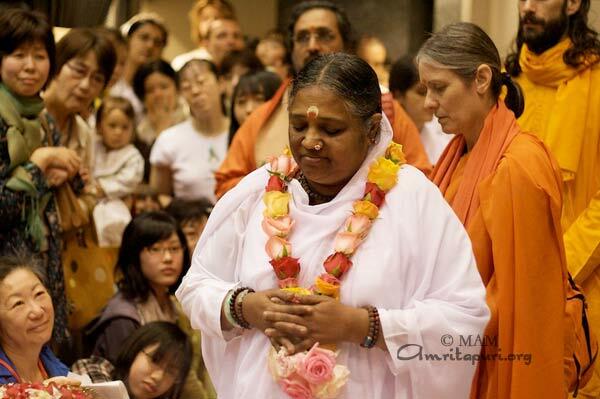 “Planting trees is like building houses for Nature,” Amma said upon blessing the trees. The group has planted 250 such saplings since January; its goal is to plant another 250 this year. 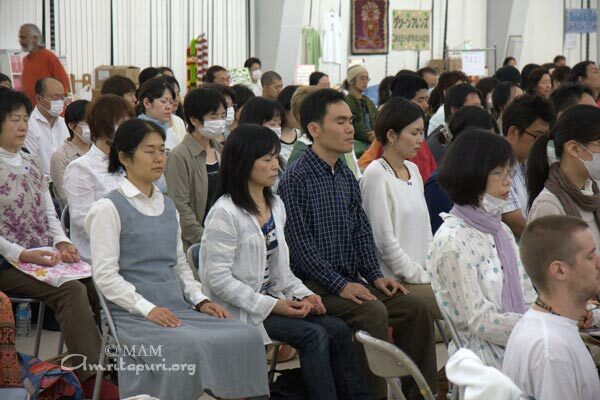 Amma’s San Ramon programs run from June 3 through June 13th, with a retreat on the final three days. She then travels to Los Angeles. Eleven representatives from the MAM attended the 17th session of the Commission on Sustainable Development (CSD-17) at the United Nations in New York. 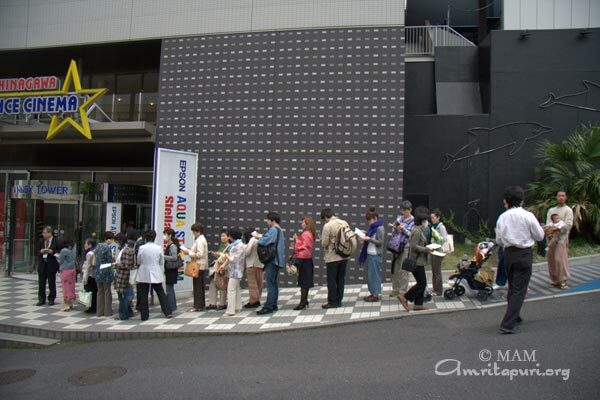 The annual conference took place from May 4 to 15, 2009, with more than 1,000 people attending, including ministers of state, distinguished members from public and private sectors, academia, and civil society. Many noted a strong synergy between the strategic initiatives of the Ashram’s Farmer Relief Project and the rural development policies and measures adopted by CSD-17. In view of the increased activities of empowerment and self reliance of AmritaSree, its name of the partnership will be updated to The Farmers’ Empowerment Project. The newly designated partnership has been cordially invited to participate in CSD-18 on year 2010.
in the photo: John H. Wells, Director, Cooperative Development Division, United States Department of Agriculture, Rural Development, during discussions at the Partnership Desk with two members of the MAM. The Telemedicine network at Amrita Institute of Medical Science has begun extending its services beyond India’s borders. On May 4, 2009, it became part of the India’s PAN-African telemedicine network. Though this telemedicne network, Amrita will provide e-health services to Benin, Burkina Faso, Gabon, Gambia, Ghana, Ethiopia, Mauritius, Nigeria, Rwanda, Senegal and Seychelles. Medical consultation in various medical specialties will be made available to care centers and hospitals in these rural areas. Through a satellite and fiber optic network, it will be able to reach out to remote and rural areas in need. PAN-African e-network is a Government of India initiative. The network’s main aim is to provide adequate educational facilities and affordable healthcare eventually in all 53 nations of the African Union. This idea was proposed by the President of India, Dr. Abdul Kalam, at the inaugural session of the PAN-African parliament held at Johannesburg in 2004. 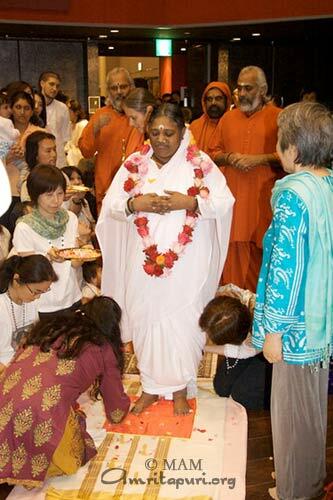 When Amma landed in Seattle on May 27th, it marked the beginning of her 23rd tour of the United States. Amma was officially welcomed to the Seattle by Richard Conlin, the President of the Seattle City Council. Addressing Amma and the gathering, Conlin said, “It is an honor and pleasure to be able to be able to welcome you to Seattle on behalf of the people of Seattle and the Seattle City Government. at one with our bodies and our hearts. Will you come and help us, O Super Natural Powers? And you, Day? And you, Night? All of you, see us as one with this world. Amma gave a total of eight programs in four days in the city, giving satsang, darshan and leading the people in meditation in bhajans. 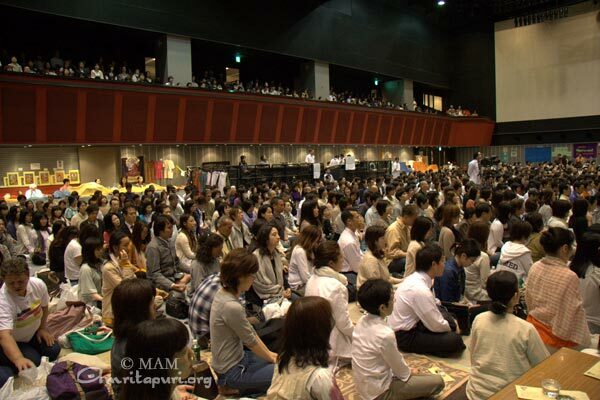 Amma visited Kobe and Tokyo, showering her infinite love on her eagerly waiting devotees. 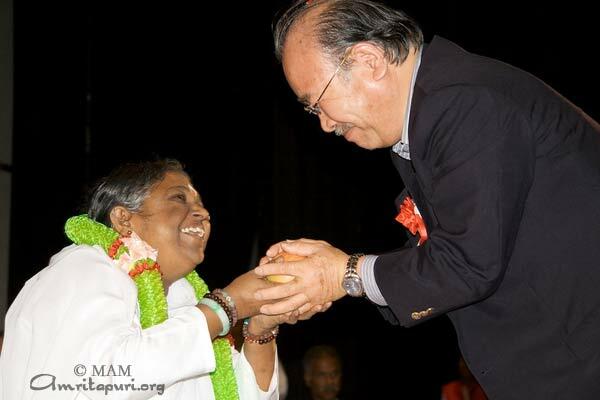 In Kobe, special guests for the opening ceremonies included Mr. Sangam Lal Tripathi, Acting Consul General of Osaka Indian Consul-General, and Mr. Kinya Sakai, Director of Sun TV Japan, who garlanded Amma and participated in the ceremonies for the release of the book, “Eternal Wisdom 3” in Japanese. 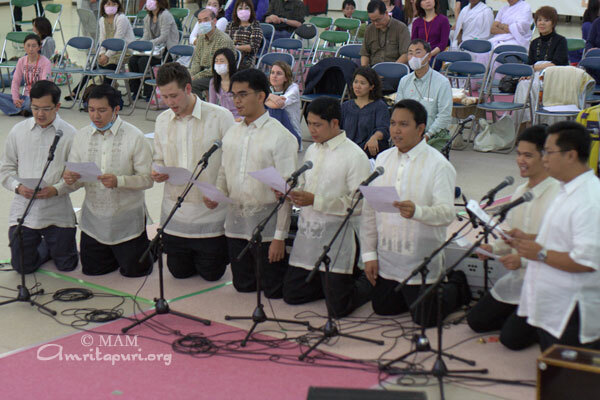 Notable performances included the heart-warming songs of the choir from the Filipino Senate and devotees from Korea singing devotional songs in traditional Korean dresses. 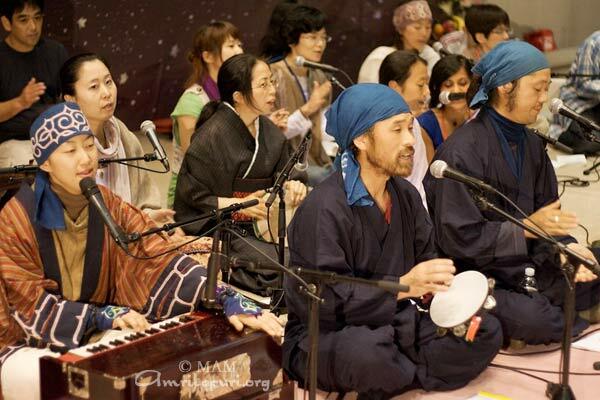 Japanese devotees sang bhajans with traditional Japanese musical instruments. 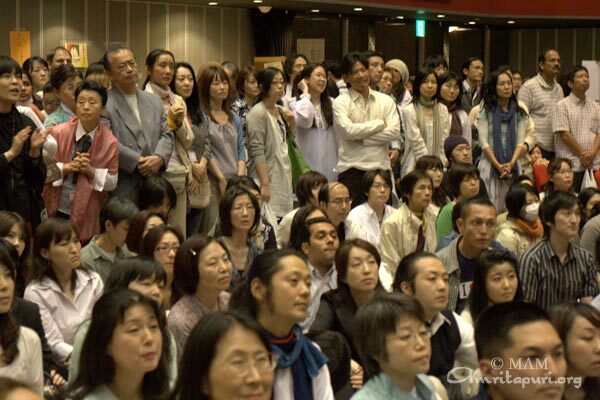 In Tokyo, special guests included Mr. Ryouhei Kamiwatari, a famous Japanese writer; Mr. Shiatsu Akizawa, former CEO of AM/PM Japan; Prof. Tsuyoshi Nara, Professor Emeritus of Tokyo Foreign Language University; Dr. T. Pankajakshan, Counsellor Science & Technology, Embassy of India, Japan; Mr. A P S Mani, Chairman, Indian Community Activities in Tokyo; and Mr. Suresh Lal, President, Nihon Kairali, the Kerala community of Japan. 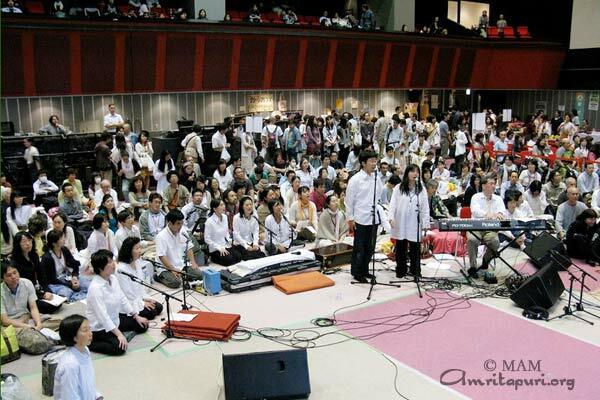 Many different groups performed for Amma including traditional South Indian dancers, and Japanese bhajan singers. 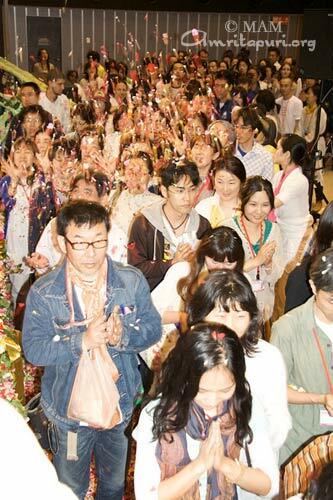 With Amma giving Devi Bhava Darshan right before them, Japanese devotees poured out their hearts, singing bhajans that touched the soul and drew beaming glances of love from Amma. 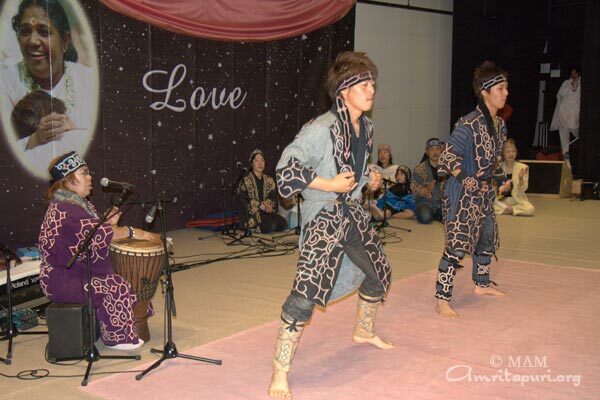 A special performance was given by Ainu tribal people from Hokkaido, Japan’s northernmost island. 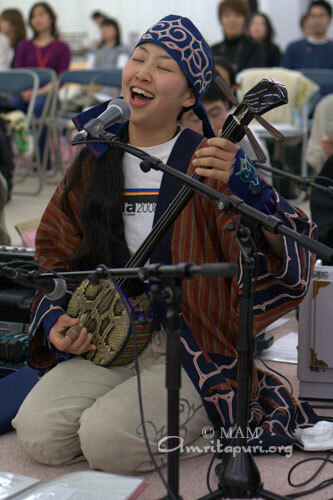 The Ainu are native people who have lived in harmony with nature, seeing God in the river, mountain, ocean, and every aspect of nature. 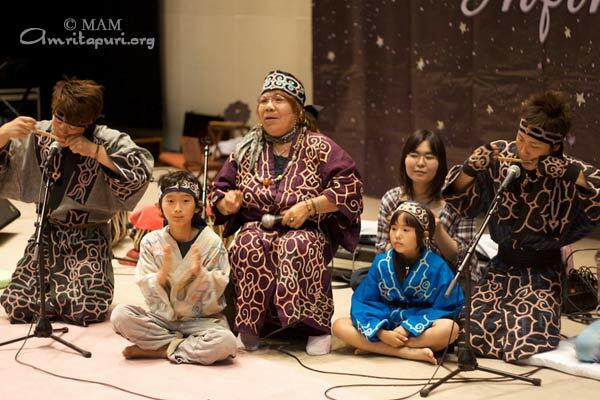 A memorable Ainu dance and song of peace was performed by a Shaman and her two sons. After meeting Amma, the Shaman described how the Ainu took up arms in the past to protect themselves and their families, but now, they repent and vow to never bear weapons and fight again. They vow to follow only God, and not others who would lead them astray to warfare.